Heat oven to 325°F. 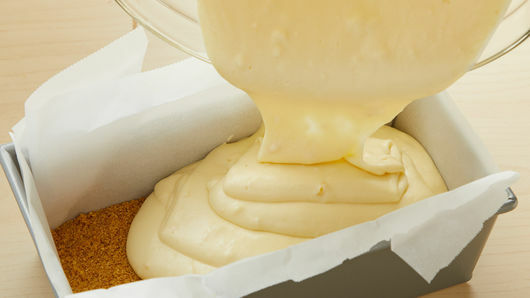 Line 9x5-inch loaf pan with cooking parchment paper, leaving enough hanging over sides to easily remove cheesecake from pan. In small bowl, stir Crust ingredients until well mixed. Firmly press mixture in bottom of loaf pan. In large bowl, beat cream cheese, 3/4 cup sugar, the flour and grated lemon zest with electric mixer on medium speed about 1 minute or until smooth. On low speed, beat in whipping cream, vanilla and eggs just until blended. Pour filling into crust, and smooth top. Place loaf pan inside 13x9-inch baking pan. Pour very hot water into baking pan around loaf pan until water is about halfway up sides of filling in loaf pan, to create water bath. Carefully place in oven. Bake 55 to 65 minutes or until cheesecake is set at least 1 inch from long edge of pan but center of cheesecake still jiggles slightly when moved. (Cheesecake will become firm during refrigeration.) Turn off oven; leave cheesecake in oven with door closed 15 minutes. Carefully remove from oven; cool in pan (with water) on cooling rack 30 minutes. Remove pan from water bath. Refrigerate about 3 hours, or until completely chilled. Using parchment ends, carefully remove cheesecake from pan. 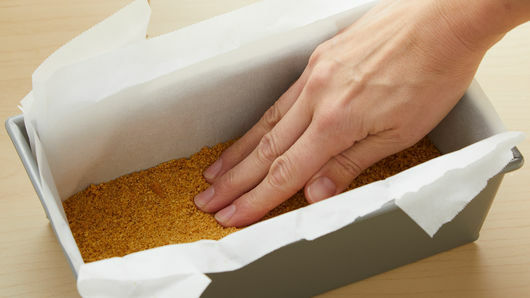 Carefully pull sides of parchment paper away from cheesecake. To cut cheesecake, use long, thin-bladed, non-serrated knife. Dip knife into hot water after each cut, cleaning off with paper towel. Serve topped with your favorite toppings, if desired. Store cheesecake loosely covered in refrigerator. 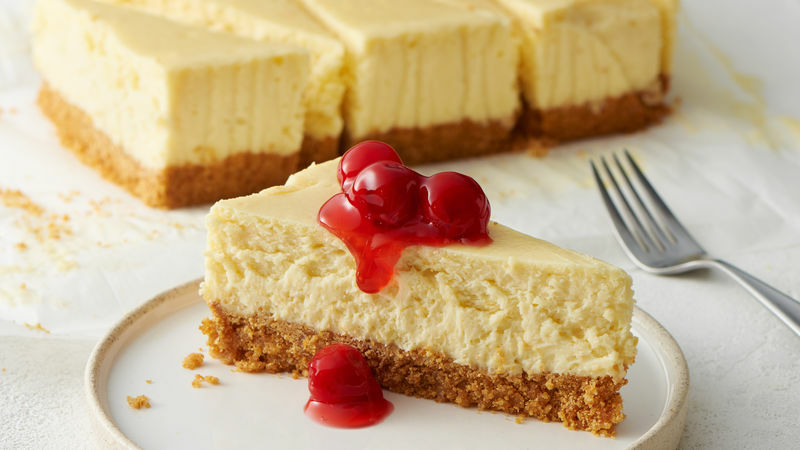 Take this cheesecake up a notch by topping with canned cherry pie filling, hot fudge drizzle, caramel sauce drizzle or even crushed cookies. This cheesecake can be covered and stored in refrigerator 3 to 5 days. Want to freeze leftover cheesecake? Precut slices, and place on cookie sheet lined with cooking parchment paper. Freeze cheesecake until solid, about six hours. Remove slices from freezer, and wrap each slice in double layer of food-safe plastic wrap; store in airtight container in freezer. To thaw, simply move wrapped pieces to refrigerator 4 to 6 hours, then serve. 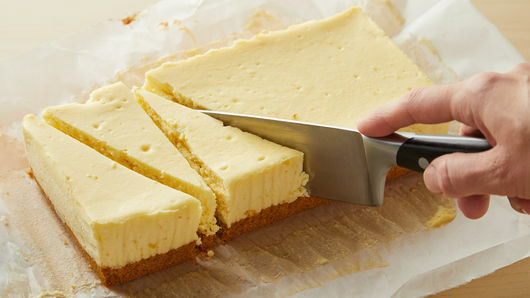 To prevent cracks in cheesecake, we incorporate a number of key techniques in our method. Beating eggs into filling just until blended helps to reduce unnecessary air, which may cause bubbles in your filling. 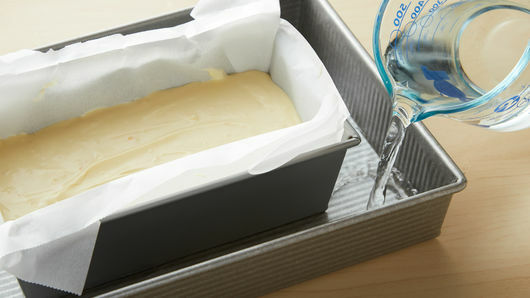 Adding a water bath helps regulate temperature so edges and center of cheesecake bake more evenly. Cooling cheesecake in oven 15 minutes with oven off and door closed before removing to continue cooling helps prevent cracks as well. We like that you don’t have to prebake the crust in this recipe. However, if you want that toasty, caramelized and slightly firmer result that comes with prebaking your crust, you can take this extra step. To do this, bake the crust at 325°F 15 minutes, and cool 15 minutes before topping with filling.